The knee is made up of two different joints. The Tibio-Femoral joint, and the patello-femoral joint. The first is the primary joint of the knee, the one that does the hinging and all the work. 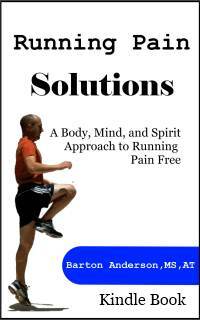 The second is the major problem causer when it comes to knee injury. Lets look at the tibio-femoral joint first. Pain along the sides of the knee, along the joint lines can be indicitive of several different possible injuries. The most common injury that causes pain along the joint line is a meniscus tear. This is especially common after the initial injury and inflammation has subsided. Once the knee is no longer swollen, the area of tenderness resides along the joint lines, runing from the front of the knee towards the back of the knee. 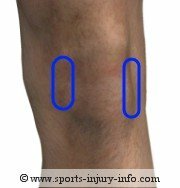 In the picture to the right, the red line is the joint line, the blue circles are where pain may be with a meniscus tear. Pain along the inside of the knee, running up and down between the two bones (the femur and the tibia) may be indicative of an MCL injury. 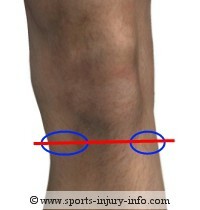 The MCL runs up and down along the inside of the knee, and with injury, causes tenderness in this spot. 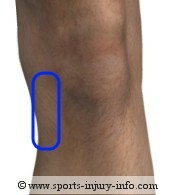 The blue circle indicates were the MCL pain may be. 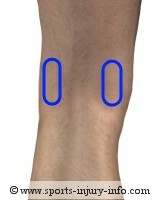 Pain along the sides of the patella (blue circles) may indicate patella femoral syndrome. This is caused by abnormal stresses on the patella. This area may be tender to the touch, or may be painful during activities. 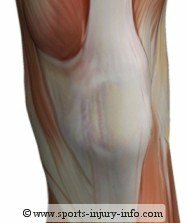 A painful knee in the area of the patellar tendon may be indicative of patellar tendonitis. patellar tendonitis. This is caused by overload stress on the patellar tendon. 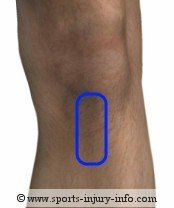 Pain along the front of the knee, as indicated by the circle, may also be patella femoral in nature.Pes Anserine Bursitis may also cause pain in the front of the knee, close to the patellar tendon. Pain along the back of the knee can be from several different things. The most common of these is a hamstring strain. The hamstring tendons insert along both sides of the knee, and can be irritated or strained, causing pain in these spots. While knee pain can be very complicated, the location of the pain is very important in determining its cause. While these different spots are not all inclusive, it should help to give you an idea of what may be causing your knee pain. As always, if you are having pain, swelling, or loss of function, please see your physician.